Composer Monty Norman was selected by producer Albert R. Broccoli after Broccoli backed a musical of Norman's, "Belle or The Ballad of Dr. Crippen", written by Wolf Mankowitz - a frequent collaborator with Norman and an original screenwriter for Dr. No. Norman's tracks were conducted by Eric Rodgers and orchestrated by Burt Rhodes. Above: Cover art from the Columbia 45RPM album released in the UK. Norman accompanied the producers and film crew to Jamaica, but midway through the production, the producers hired composer John Barry to rearrange the main theme and write the rest of the music for the film. The change in composer introduced inconsistencies between the film and the soundtrack. The music in film was almost entirely John Barry's, while the soundtrack is mostly Monty Normans work, most of which was unused in the film. The original "James Bond Theme" was written by Monty Norman. Barry, who would later go on to compose the music for eleven Bond films, arranged the Bond theme, but was uncredited - except for the credit of his orchestra playing the final piece. It has occasionally been suggested that Barry, not Norman, composed the "James Bond Theme". This argument has been the subject of two court cases, the most recent in 2001, which Norman won. Some portions of the theme actually originated from a song, "Good Sign, Bad Sign" composed by Norman from an aborted musical, "The House of Mr. Biswas", several years previously. In its original form, the music is almost unrecognisable to the Bond theme. Many fans consider Barry's arrangement the most important element in crafting what is now one of the most recognisable themes in the world. Barry has rarely spoken about the dispute over the song's credit, except to question why Norman was not brought back on subsequent Bond movies. The selection of Diana Coupland to sing on two of the tracks, including "Under The Mango Tree", was no doubt influenced by her being married to Norman at the time. 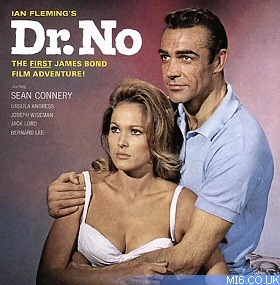 The soundtrack album of Dr. No was not originally issued to coincide with the film's initial release in October 1962. However, in addition to his fee for orchestrating The James Bond Theme, Barry was allowed to perform a different orchestration of the theme on Columbia Records. This became a top ten hit in the U.K. 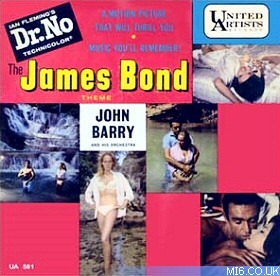 The soundtrack album came out after the American release of Dr. No in June 1963 with American single recordings of The James Bond Theme by Al Caiola and Leroy Holmes on United Artists Records and Si Zentner on Liberty Records. In addition to Barry's orchestration of the "James Bond Theme" most of the tracks on the album were performed by Byron Lee & the Dragonaires who appear in the film singing "Jump Up". The soundtrack is an oddity in that is contains mostly a representation of Jamaican local music rather than film score. None of the Eric Rogers orchestrated tracks appear on the soundtrack album. Above: Cover art from the United Artists LP release in 1962 in the USA (UA 581). One musical theme that appears in three different orchestrations on the album: Dr. No's Fantasy, Twisting with James and the misleadingly entitled "The James Bond Theme" (track 17 on the album, but entirely unrelated to the "track 1"), is not heard anywhere in the film. Diana Coupland recalled that it was Norman's first attempt at a 'James Bond Theme'. Notable omissions from the soundtrack include the film's opening sci-fi electronic music sound effects/"James Bond Theme" gunbarrel sequence, and Eric Rogers symphonic arrangements of Norman's score including a brief theme for Miss Moneypenny and the music from the tarantula scene as well as Dr. No's death (reused during the climax of the helicopter attack in From Russia with Love but not on that soundtrack album either). Nic Raine later rerecorded some cues from the film (unheard on the original soundtrack) for the "Bond Back In Action" album.